This unit is REAL TRADITIONAL 3 FLOOR SINGLE HOUSE with free car parking lot. Historic house build right after atomic bomb drop at 1945s , purely wooden. Building right locate at river side ,- the perfect base to experience all the city has to offer, and a 15 minute walk to the Peace Park. Wonderful wooden single house provide you a huge space and incredible real Japanese experience with Historic story / Aamazing river sense . This Japanese house have 5 rooms for your family . This is available with 12 people and is located in rive side . Free parking area is offering !! You can enjoy Hiroshima for your long vacation, The unit provide you the Washing machine and dryer in this house. 7-minute walk brings you to the nearest station from this apartment. Please enjoy yourself in Great place, Hiroshima! The Japanese house left for 70 years, build right after the atomic bomb 1 year at 1945s , entire historical story and prove is here !!! Great renovation did an isolated house wholly. It's made the condition and something good old is made important as much as possible. This huge space provide with real Japanese / human history for your group , if you are looking for experience the really Japanese style in Hiroshima , here will be the place for you . There are restroom face washing and taking a bath in 7 square meters of easy kitchen in addition to a Japanese-style room of about 26 square meters of tatami and other things in your room. 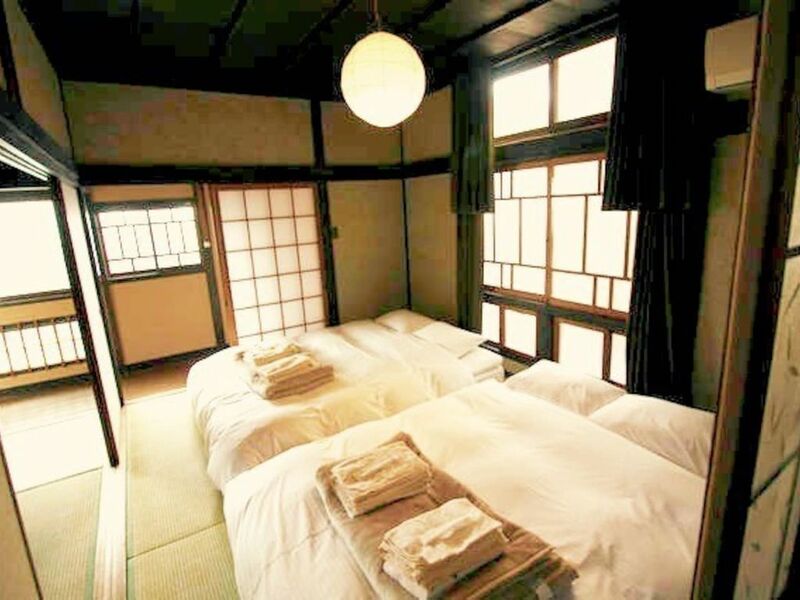 Wonderful of the old good Japanese house as well as the fragrance of the real tatami can be experienced. A PC as well as the free wifi can also be used. In my apartment ,offer with 1 gas heater , plus each room offer with air-condition which provide heating and cooling air depending on you need . This house has 3 double beds, 4 single beds , 2 futons. For more concerned will be email for communication to the guest before arrived . This apartment is a ELECTRONIC KEY DOOR. password will be given by email or call the day that you arrived. Hello , I have my own professional stuff to working on emergency situation . Due to your long stay you need more fresh new towels , your garbage is full , please feel free to contact me via airbnb message , I will always welcome to help you for any problem . If you need order an taxi , please let me know as early as possible, because depending on the time , it's not always possible to have a Taxi service while on your check out date . The easiest way is to ride this Limousine bus service. This coach service brings you to Hiroshima station directly. I have hire a professional hotel cleaning team to prepare the apartment for you . so surly can have a very nice clean apartment during your vacation . if in any case , you have any problem, trouble , or question , please contact me via airbnb message , I will always reply you as soon as possible and if needs I will send my stuff to solve your problem at any moment . The front is self-service, all the set are in the storage/shelf, with English label on it, clean bed sheets, pillow cover, futon mat, these are real Japanese style, it's super simple you can set up in 2 mins. If you have any questions about this issue, please feel free to contact airbnb customer service. We loved the house, especially my daughters, who called it a Ninja house. It's rather big when You are a family of four. As a family, used to make our own food, we where a bit challenged by the lack of kitchen equipment. But if You're to eating out, or You're to delivered food, no problem. We loved the house with all it's rooms and sliding doors. Would definitely book again, if I ever come to Hiroshima again.